The Israel Defense Forces has asked the Shin Bet security service and the police to provide it with information on left-wing figures active in the West Bank so it will be easier to issue restraining orders against them, Haaretz has learned. Since the IDF does not gather intelligence on Israeli citizens, the GOC Central Command depends on evaluations by the Shin Bet prior to signing restraining orders. So far, such orders have only been issued against extreme right-wing activists suspected of subversive activities. 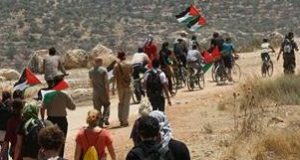 This time, the army has focused on a number of activists protesting the security fence, those who help Palestinians harvest their olives, and others. This is apparently the first time left-wing activists have been the possible target of such orders. 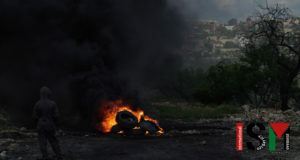 To obtain the intelligence information it needs to back up the request for a restraining order, the Central Command approached the Shin Bet and the Judea and Samaria police districts requesting material that had been gathered on the activists. The police were also asked to present all information they had on these individuals, including cases that had been closed. The army further asked the police and the Shin Bet to keep their work on the matter secret. 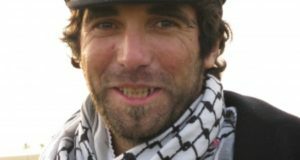 Among the activists the intelligence services were asked to provide information about is Yonatan Pollack of Anarchists Against the Fence.